In just 67 days, Ohio voters will weigh-in on whether they reelect incumbent Republican Senator Rob Portman or elect former Gov. Ted Strickland to the United States Senate. The difference between the two candidates is as vast as the ocean is deep. Unfortunately, Ohioans have suffered for nearly six years through the fog of misguided attacks on the former governor that Ohio media has done precious little to sort out based on facts and figures that are readily available to them. GOP’s “Ohio was Broken” brochure distributed at state Republican annual dinner featuring keynote speaker Haley Barbour. Ohio’s aging but still immature governor John Kasich, who has failed twice now to win the adoration of Republican base voters as their presidential nominee, has been allowed to dish out his patently false narrative that Ohio was broke when he squeaked to a narrow win in 2010. Time after time, from his first campaign year through his journey to reelection in 2014, the same year some of his closest allies and political operatives engaged in Nixonian-era dirty tricks to scrub a potential vote taker from the ballot, he has enjoyed the freedom to spout the absolutely false narrative that Ohio was $8 billion in the hole without statehouse reporters taking him to task on an exaggeration that remains alive and well today. Gov. 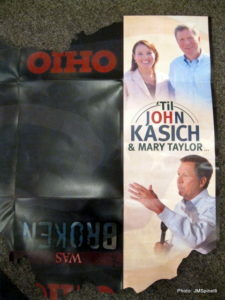 Kasich bemoaned the state of the state he inherited upon becoming Ohio’s 69th chief executive. All the states woes were dumped at the feet of Ted Strickland, who despite steering the state into safe harbor as the worst economic meltdown since the Great Recession took its toll on Ohio as it did on nearly every other state has failed to earn a scintilla of credit for the great job he did, that was compounded by a reluctant legislature controlled by hostile Republicans for two of his four years. Mr. Strickland has failed to mount a strong, offensive campaign to tell Ohioans that their state would be far, far worse off had policies choices preferred by John Kasich and all other Republicans, including Sen. Portman, been pursued instead of the one’s Strickland had in his tool kit that included federal funds. Plunderbund asked the former governor whether Mr. Kasich had inherited a state still on the decline or on a road to recovery. Reported by no other media present at the press gaggle earlier this year, Ted Strickland said he gave John Kasich a state on the mend. Indeed, as he left office, Mr. Strickland gave Gov. Kasich a billion or more in revenue after having reduced Ohio’s unemployment rate by almost two percentage points. In his campaign for reelection this year, Rob Portman, who was budget director then chief trade representative to President George W. Bush—a president who over his eight years in office actually lost a net of a half-million jobs and teed up the economic meltdown that still plagues the country—has managed to fool enough Ohioans and all Ohio media that his GOP ideology of austerity, especially for individuals but not corporations, is the right course. Afraid to be seen with Donald John Trump, the loony New York billionaire who thrashed John Kasich and 15 other White House wannabes, Rob Portman enjoys a lead over Ted Strickland, as his negative ads attacking the former governor repeat the false nuggets Kasich and Washington Republicans have used, that media has permitted to live when they should have been blasted into outer space as patently false. It will be a tour de force if Mr. Strickland can come from behind to unseat Mr. Portman this year. One step to right the message comes in a call from Team Strickland for Portman and friends to stop running a TV ad that PolitiFact has labeled a “Pants on Fire” lie. Strickland campaign staffers are calling on Portman to demand the ad be taken off the air. First it was John Kasich who misrepresented Strickland’s one-term in office, which by the way followed years of economic stagnation even though Republicans had controlled the state from top to bottom, including the legislature, since 1994. Now it’s Rob Portman who has picked up the torch of false allegations from his political buddy and ideological soul make, John Kasich. Rob Portman loves to talk about opioid abuse but doesn’t like to admit that he votes against funding for it because it’s all about government spending, and he’s against that except when it comes to military spending, the most expensive kind of government spending. As budget chief then trade representative, Rob Portman shoulders all the troubles that came from two terms of George W. Bush, which includes the Great Recession and all the jobs it took from Ohio, that Portman tries to saddle Ted Strickland with. As Sen. Portman hopes voters will ticket split their vote—voting for Hillary Clinton for president but him for another six-year term—Ohioans should understand that Rob Portman is engaged in a campaign of deceit and dishonesty. If Republicans try to paint Mrs. Clinton as dishonest and not trustworthy, Democrats are failing to do the same for Mr. Portman. His many ads, funding with tens of millions from wealthy outside Republican leaning groups, depend on media not knowing the history to who stepped up to save Ohio when the chips were down. Can Ted Strickland still win? Elizabeth Warren, the firebrand senator from Massachusetts, says he can, because she did even though she trailed her incumbent opponent by about as much as the same time.